In some countries all public-sector institutions are only accepting invoices in electronic format. This affects your company if it does business with public-sector customers. You must change your invoicing system if you sell goods or services to the state, counties or municipalities. These can be day-care institutions, schools, hospitals or government ministries, for instance. If you do not sell goods or services to the public sector, the electronic invoicing requirement does not immediately affect you. Public institutions were receiving millions of paper invoices per year. Electronic invoicing was enacted to save money for taxpayers and society in general. The public sector and private companies can now save substantial amounts on paper, printing, postage and manual typing by handling billing electronically. If you have sent paper invoices to public sector customers they are not required to pay until they receive the bills in digital format. New information is required on all invoices, like EAN numbers. Your invoices must be converted to digital format, provided you are a company located in certain countries like Denmark (ie. have a CVR. number). EAN number In precise terms, the EAN number is an “EAN location number.” It consist of 13 digits which clearly identify the public sector entity. This can be an institution, a department , a function or an account. All public institutions in national government, counties and municipalities have one or more EAN numbers. In some cases, an entire county may use the same EAN number. In other cases, a single institution may have several EAN numbers, such as for each department or accounting unit. The EAN number must be included in all invoices – also in invoices which are first written in paper format. The EAN number corresponds to an electronic postal address. If you forget the EAN number, it has the same effect as forgetting to address an envelope. You risk not being paid if the invoice does not reach the intended recipient! If you send numerous invoices to public sector customers, it’s an advantage to use an electronic invoicing system. This way, you avoid having to print and send bills, or type them into a web site. Electronic invoicing module / Add on can read the invoices from source system, where invoices are being generated and call services of public sector’s accounting system and stores the response of service call to keep track of invoices that are successfully e-invoiced. The electronic invoicing system could be a supplementary module or separate invoicing system. Steps to Integrate Electronic Invoicing in Business By Design. Query Released Customer Invoices in Business By Design , based on Release Status Code and Last Changed Date . 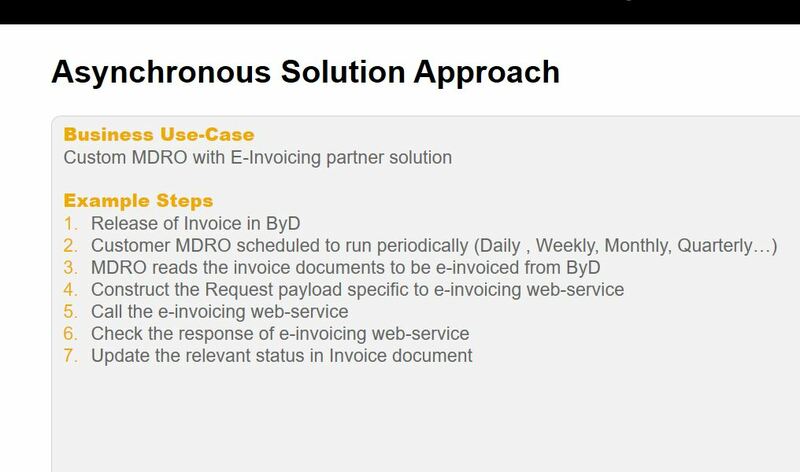 Create an Partner MDRO to periodically query customer invoice web-service on ByD and create relevant customer invoices entry along with its status in Partner BO instance. Make a note of released invoices in Partner Business Object . Update the Partner Business Object instance with status of web-service call. The status in Partner BO instance keep track of e-invoicing service call, which can be used for reporting purpose. Query Released Supplier Invoices in Business By Design , based on Posting Status Code and Last Changed Date . Create an Partner MDRO to periodically query supplier invoice web-service on ByD and create relevant supplier invoices entry along with its status in Partner BO instance. Update the Partner Business Object instance with status of webservice call. Thank you for this blog for showing on a general understanding of the e-invoicing topic with SAP ByDesign. However, I would express there are more challenges for this e-invoicing topic. For example, we have Kazakhstan e-invoicing topic which the complexity is known for the GTD number and other fields that have to be hard coded based on the business transactions. 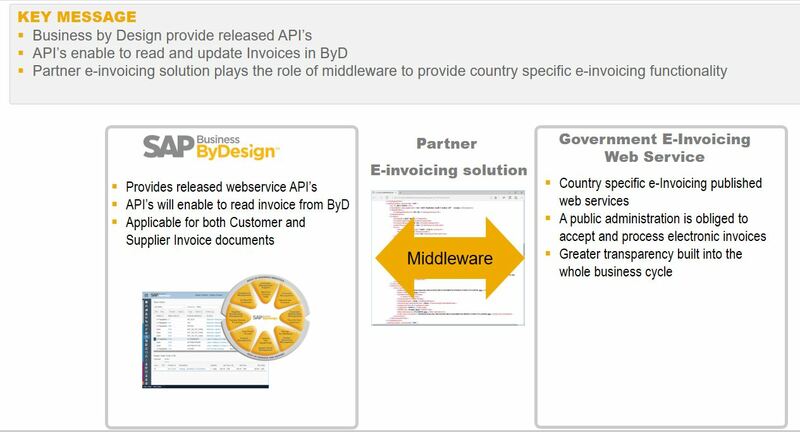 Do you have somehow the overview of the e-invoicing topic for the ByDesign countries? The blog explains the general understanding of e-invoicing and overview of one of the solution approach which involves partner implementation. From my understanding Kazakhstan e-invoicing which involves “GTD number and other fields” that are added will be extension fields. those extension fields could be retrieved as part of Query response of Customer Invoice and Supplier Invoices and rest of the solution above should hold good. May I ask you an additional query around this subject. Business in Italy are already mandated by the Tax Authority to produce Electronic Tax Invoice for Public Administration Customer? How we do this ByDesign today? 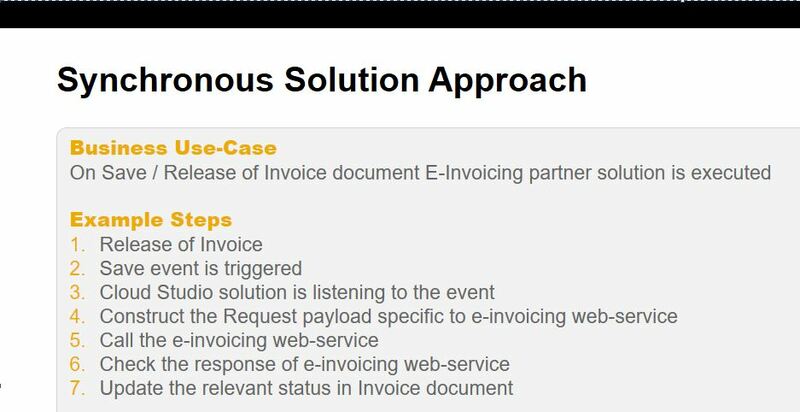 the Blog addresses the generic approach of “E-Invoicing Integration with SAP ByDesign” . For detailed approach with possible solutions , refer to attached snapshot.